Mike Brede, along with Larry Banks, started an online community for people to meet and share information on the local backcountry scene at panhandlebackcountry.com. A few years ago, I was living in Coeur d'Alene and flush with cash from a good restaurant serving job. Having always wanted to ski backcountry, I kicked down the hundreds of dollars it took to turn my regular ski setup into a backcountry rig. With an avalanche beacon, climbing skins and more, I was ready to take on the local backcountry. There was only one problem: I don't know the first thing about avalanche safety and I didn't have any friends to show me the ropes. I thought about signing up for an avalanche safety course but ended up staying in-bounds all winter. Fast-forward to this winter and my gear has been collecting dust for years. But now, as the snow has started to fly, I'm ready to finally make it happen. Luckily for me, and anyone else trying to get into backcountry skiing and snowboarding in the Inland Northwest, five years ago Mike Brede and Larry Banks started an online community for people to meet each other and share information on the local backcountry scene. In the five years since its creation, panhandlebackcountry.com has grown from the brainchild of a couple of skiing buddies to a community of more than 1,100 members sharing trip reports, meeting touring partners and connecting each other to local resources like avalanche forecasts, safety classes and used ski gear. "I'm surprised at how big we've become," says Brede. "There's a lot of interest in just seeing what people are skiing around here." Brede says the website has attracted users from as far away as New Zealand and averages about 2,000 unique visits a month. In building the website and local backcountry scene, Brede and Banks have tried, and so far succeeded, in steering the group away from two major pitfalls of extreme sports: hypermasculinity and context-free stoke. "For the last four years we've worked on women-specific backcountry projects," Brede says. The website has partnered with the women-centered She Jumps organization to help promote women-specific avalanche classes. Melissa Hendrickson, who helped teach a backcountry awareness class for women last year and is teaching an avalanche safety class this winter, is an active member of the Panhandle Backcountry community and an avalanche forecaster for the Idaho Panhandle Avalanche Center (idahopanhandleavalanche.org). By teaching and presenting at local events, she helps women get into the sport as a female face for the backcountry community. "The website is a great way to meet people," Hendrickson says. But, she also recommends taking one of the handful of local avalanche safety classes listed on the website as a great way to learn what it takes to stay safe in the backcountry. 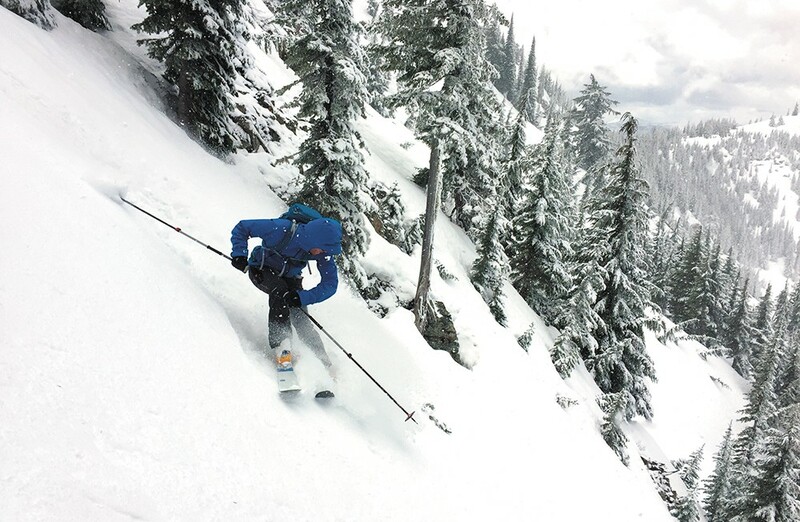 While Panhandle Backcountry introduces people to the inherently adrenaline-fueled world of backcountry skiing, it also takes steps to make sure people realize the risks of heading out onto unpatrolled and remote slopes. On the website, getting people stoked on "sick lines" and "gnarly terrain" takes a back seat to more practical knowledge about snow conditions and avalanche dangers. In the trip report section, which doesn't allow peeking by snoopers because it requires users to sign-up for a free account and make a brief personal introduction, the site moderators ask users to help build the knowledge base of local conditions around the region. By including information like snowpack stability and any signs of local avalanche behavior, users of the site can know what to expect and which areas to avoid when they head out for turns. In addition to serving as an informal venue for sharing information on local snow conditions, Panhandle Backcountry partners with and helps raise money for the professional forecasters at the Idaho Panhandle Avalanche Center, which issues avalanche forecasts for the region on Tuesday and Friday mornings. In October, Panhandle Backcountry raised money for the forecasters at the premiere of an ecologically and culturally driven snowboard movie Yugen Film at the Garland Theater. After a couple storms rolled in, and in anticipation of this article, I reached out to Brede and Banks to learn more about the website and community they've helped create. Just days after talking with them, I got a text from Banks asking if I was interested in a backcountry trip on the first weekend in December. An offer too good to pass up. So there I was, dusting off my languishing backcountry gear, checking the batteries on my avalanche beacon and getting stoked on the prospect of some early season turns. The trip, out of Wallace and up to the Glidden Lakes area, wasn't without a few fumbles and rookie mistakes — accidentally jamming the throttle and forcing us to bail once on the snowmobile ride out and not understanding how my touring bindings worked — but at the end of day I was like a kid in a candy store skiing untracked lines on either side of a ridge that splits Montana and Idaho. Carl Segerstrom is a journalist who covers the environment and communities of the American West. He is a contributing editor for High Country News magazine. Follow him on Twitter @carlschirps. The original print version of this article was headlined "Like-Minded Souls"